Samuel Holland (1713-1801) at an early age joined the British army as lieutenant of engineers and served in Europe. Promoted captain in 1756, and appointed aide-de-camp to Wolfe. Served at Louisbourg, and while there gave instruction in surveying to Captain Simcoe of the navy, father of the first lieutenant-governor of Upper Canada. Under Captain Simcoe, James Cook while serving as master in his ship at the siege of Quebec and later the celebrated circumnavigator, learned the rudiments of marine surveying. 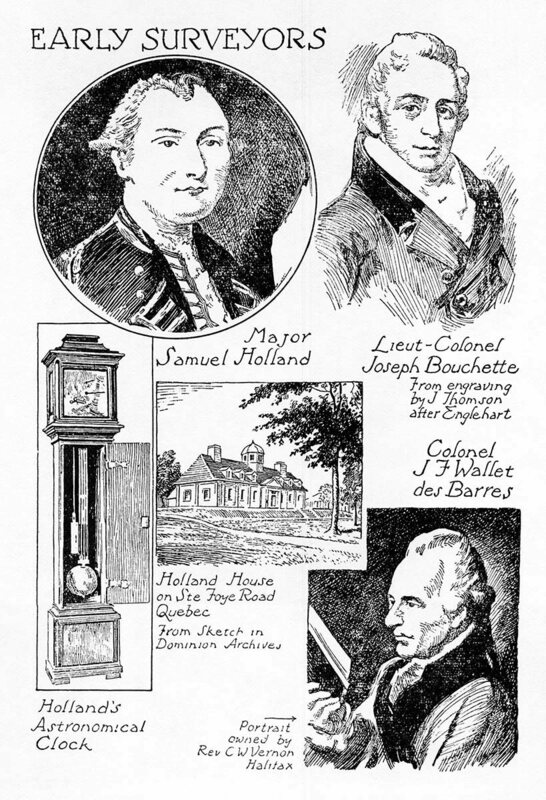 Holland was engineer in chief at the siege of Quebec. In 1763 he was appointed Surveyor-General of Quebec and Director of Surveys in British North America. 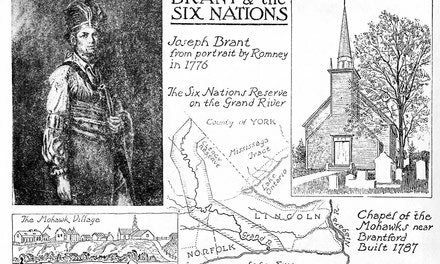 Many of his maps are in the Archives at Ottawa. Holland House was Montgomery's headquarters during the siege of Quebec in 1775. Joseph Frederic Wallet des Barres, born in England in 1722, of French Huguenot ancestry, died at Halifax, N.S., in 1824, at the age of 102. Served as lieutenant in the 60th Regiment in America. Rose to the rank of Brevet Colonel, Lieut.-Governor of Cape Breton, 1784-1787, and of Prince Edward Island, 1805-1812. Founded Sydney, N.S., 1785. Des Barres surveyed the coasts of the Maritime Provinces, and made many fine maps and views, which were published in his great work, The Atlantic Neptune. A magnificent set of these volumes is in the Archives of Canada. Joseph Bouchette, born at Quebec 1774, died 1841, was the son of Jean Bouchette. The father had been in the government service under the French regime and after the British conquest entered the Provincial Navy, in which he attained the rank of Commodore. 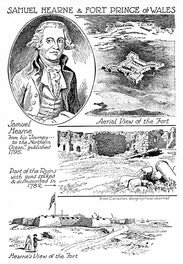 He conducted the escape of Governor Sir Guy Carleton from Montreal on the approach of Montgomery's army in 1775, conveying him and his aides, disguised as habitants, in an open boat past the American vessels and land batteries commanding the river. Joseph, the son, served in the Provincial Navy under his father until 1796-1797. He made the first survey of Toronto harbour in 1793. In 1804 he was appointed Surveyor-General of Lower Canada. In 1815, aided by a money grant from the legislature, he published his Topographical Description of Lower Canada in 1815, and on promise of the purchase of a number of copies of a new work went to England in 1829 to supervise the production of his British Dominions in North America, which was published in three volumes in London in 1832. These works contain many fine maps and engravings of Canadian scenery. Bouchette presented a de-luxe copy to King William IV at a special audience, and a collection of engravings from his sketches to the Duchess of Kent, on which occasion he saw the Princess Victoria, her daughter, the future Queen, then at the age of fourteen. The legislature failed to purchase the promised copies, and Bouchette's undertaking resulted in a serious financial loss to him. Observe various styles of hair-dressing at different dates. Fort Prince of Wales is situated at the mouth of Churchill River, on Hudson Bay. Its construction began in 1733 and was completed in 1771.